← Corvair College #33 sign up closes Sunday 3/29, 9pm EST. Ten years ago, at Corvair College #9, a young man showed up after a very long trip: He had taken a Greyhound bus from Ohio to Edgewater, Florida He was only able to stay at the College for 24 hours before he had to catch the return bus. He was a college student, he had done a lot of research, and he asked good questions. Serious builders were impressed with his attitude, and the commitment to have his seat at the table of experimental aviation. Tonight, nearly ten years later, despite all the obstacles that life can serve, Tim’s carefully built 100 HP Corvair, a product of his own hands and mind, fired up for a perfect test run. 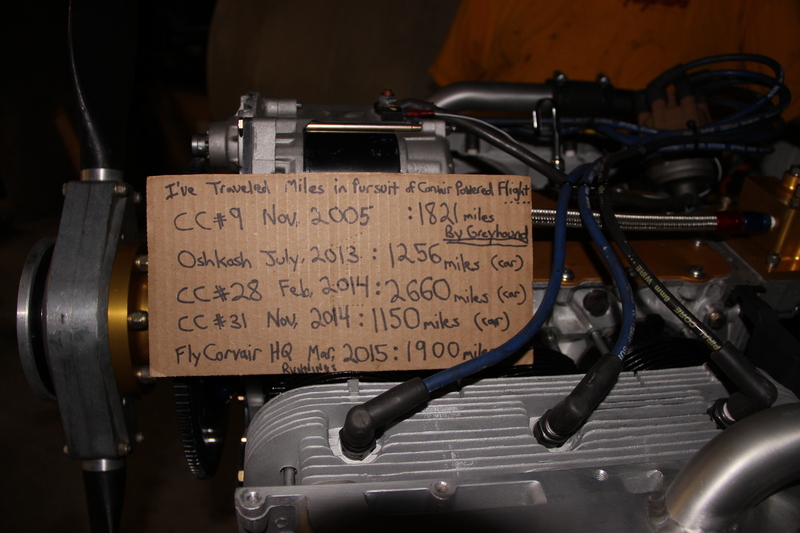 The running engine is destined for his homebuilt, but the achievement isn’t the powerplant. It is in Tim’s attitude to really learn and understand engines, to build an excellent example, to be persistent when others are not. The reward is internal, it cannot be diminished, lost, spent nor taken away. He owns it, period. In most other aviation settings, people’s value is judged by the thickness of their wallet. That attitude is abhorrent to me. Conversely, in the Corvair movement, the value of an individual is judged solely on his personal commitment to the original EAA motto “Learn, Build and Fly.” In the pantheon of tradition builders whom I have met in two-and-a-half decades in experimental aviation, Tim Hansen holds a very special place, as he is the personification of my Golden Rule of homebuilding: Persistence Pays. Above, Tim’s engine on the run stand on the ramp in front of our hangar. After Corvair College #31, out of respect for his personal commitment, Grace extended a rare invitation to our home, to have Tim finish and test run his engine. The weekend was the only open date in Tim’s work schedule. He drove down from Ohio, worked for a day, and had it on the stand by 9 PM Saturday. 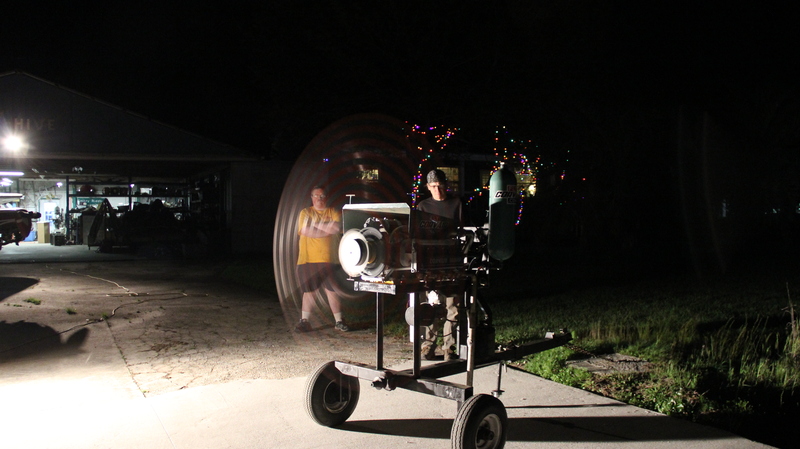 Congratulations to Tim, just after it fired up. A memorable moment In The Arena. 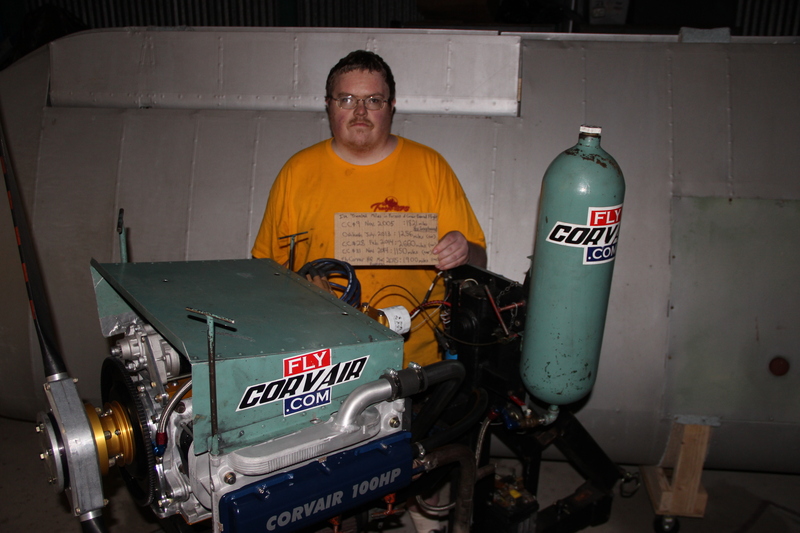 The engine is a 2,700 cc Corvair with a Weseman Gen II 5th bearing and all of our gold systems and parts. Tim was on a budget, but he long ago set his personal standard, that his own engine would be first class. He was focused on getting everything he could from the process, not doing it as cheaply as possible. Above Tim with his engine after the run. The sign he holds tell the story of a man who would not be dissuaded from his goal. Read closely: Tim traveled 8,787 miles, 1,821 of them by bus, to learn the skills, processes, techniques and understanding so that he may rightfully use the title “Motorhead.” In the decade since his first arrival at College #9, Tim also earned a private pilot rating and had built a substantial amount of hours becoming an Airman. The achievements were gained against life’s adversities: In the early years, a cycle accident put Tim in a wheelchair for six months and brought a mountain of uncovered medical expense. Most people would have seen these as acceptable reasons for walking away from the dream of flight, but Tim Hansen isn’t “most people” – he has his own standards for himself. 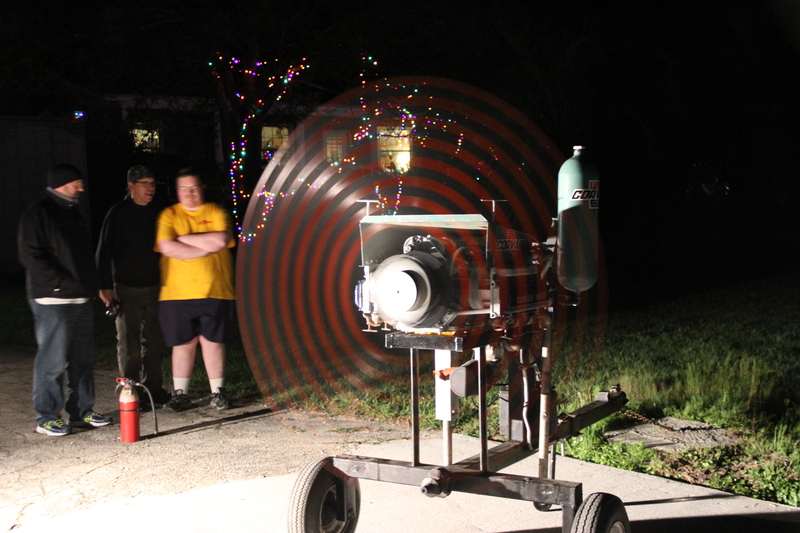 Tim’s engine puts down a night break in run in, outside the hangar in our front yard. Grace keeps the Christmas lights up 365 nights a year. By coincidence, on the left, well known 601XL/Corvair builder and Pilot Phil Maxson, (Phil Maxson goes to 3,000 cc for his 601XL ) was in the area. He was on hand to welcome Tim into the ranks of successful Corvair builders. 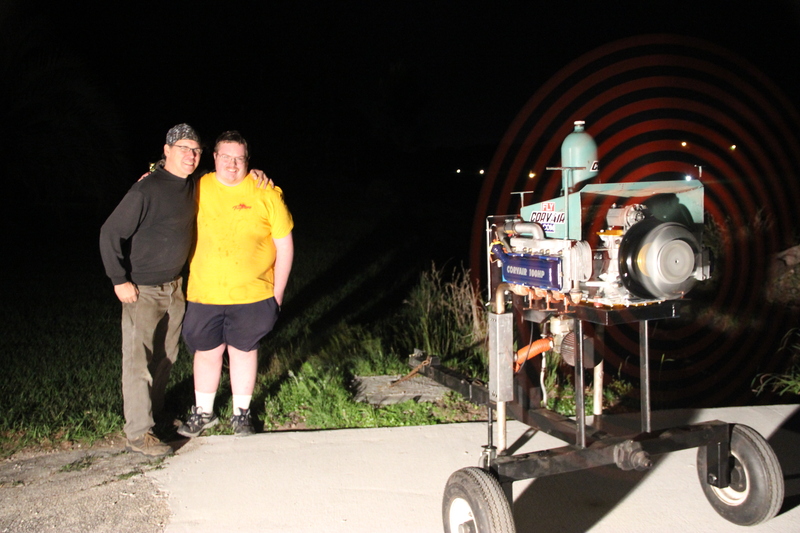 Phil stayed to see the engine run, because he is a member of our community of builders, a group defined by their traditional take on “Learn, Build and Fly.” Most experimental engines are simple consumer products with nothing to unite their owners except the amount of money they spent. For builders looking for more from their hours in aviation, we have a setting where craftsmanship, commitment and camaraderie all retain their traditional value as the primary currency of aviators. Grace worked many years to become an aviator herself, and she has a special understanding for any individual who sets themselves to the task, keeps their standards high, and refuses to quit. Above, Grace shares Tim’s hour of victory. After a few photos, we threw some steaks on the grill, and had a late dinner, spending the time remembering events from the past decade, and speaking of good things to come. As I write this, it is now 3 am, and everyone has long gone to bed. The morning will bring a long drive back to Ohio for Tim, and a full day of College #33 prep for us. Yet I am kept awake by thoughts of having just been present at a major milestone in the path of another aviator. Next week, someone will ask what is the reward of our work with Corvairs, and I will simply refer them to this story. Where I grew up in Maine, we would have said, “ayuh, he did good”(grammar notwithstanding). Tim personifies what the learn,build,fly journey is about. Conrgrats to Tim and glad you posted this William. Conratulations Tim!!! I met you at CC31 in Barnwell and was in awe of your commitment and perseverance. You have built a first class engine built by a first class builder! You personify what the Corvair movement is all about. Although William is correct stating that you have a long ride ahead of you in the morning back to Ohio…what a sweet ride it will be! I still remember my ride home from Barnwell after running my 2 engines. It’s amazing that I didn’t get into an accident since my mind was out in Corvairland throughout the drive! Great story! I especially like the quotable quote of the last paragraph. 1. I am going to print out 2 pictures. 1). Is the picture of you and Tim, big smiles, and arms around each other. That will remind of the hard work you put in to support Tim’s hard work. And 2) is the picture to remind me of when I get a little down working on my project, that I have about 8,000+ miles to drive before I even think about quitting. 2. The second thing I am going to put a picture of Tim in my dictionary (figuratively) so when I need to look up the definition of persistence, Tim will be right there. He is the definition! You are to be admired and commended for your amazing resilience in the face of some seemingly insurmountable obstacles. You have certainly earned the right to be addressed as “Motor-Head” and should consider a T-shirt with your Motor-head name on it and the information from your 8,787 miles traveled. By what you have accomplished you have taken away the excuses of many for why something cannot be done … if that’s what they really wanted in the first place. I did see you at CC#31 but don’t believe we had an opportunity to speak. I did capture you in several scenes in the video I shot at the College but I was only there for a few hours on Saturday. Certainly hope to meet again soon and hear your story in person! Nice job, Tim! I’m glad to have been there when you crossed the finish line. Not only was it nice to make your acquaintance, but it was a pleasure working with you for a little while. Seeing (and hearing) an engine start up for the first time never gets old! Your engine reminds me very much of my first Corvair. 2700, 30 over, unpainted block, black cylinders. Of course it has all the latest gold components that weren’t available when my engine was built so many years ago. Congrats Tim, persistence and patience is a virtue. Thanks to individuals like William that not only shares his knowlage but takes note of peoples effort and has the thoughtfulness to write about it to share with others and maybe even inspire!! Congrats, Tim! A well-earned achievement. For those of you have not met Tim, he’s an extremely smart and personable guy. He’s also got a great sense of humor. I just wanted to say thanks for all the well wishes regarding my engine run, it was a great moment to see something I made fire up for the first time. All of you whom I’ve met or spoken to along the way did your part to keep me going. If I ever talked your ear off about flying or asked you a question, you were part of my success. Most of all, I especially want to thank William and Grace for their hospitality, encouragement, and tireless efforts to assist builders like me in our dreams of flight. I have learned a lot, and made many friends at Corvair Colleges. To anyone wondering whether homebuilding is for them, I can only present myself as evidence that if you’re willing to put in the effort, you will be rewarded with the satisfaction of seeing the fruits of your labor come to life. Get out there and Learn, Build, FLY! Congratulations, Tim. Your story is giving me the push to move forward. I live an hour SW of you in West Chester and would very much like to see your engine…reply here if you are up for it and we can make arrangements. Thanks Daryl. I’d be happy to meet with you, when our schedules allow, and talk engines. Email is glich7(at)juno dot com. Everyone has their shirts on, WTF? Looks really great Tim! Glad to see that you got her running well… quite an accomplishment.